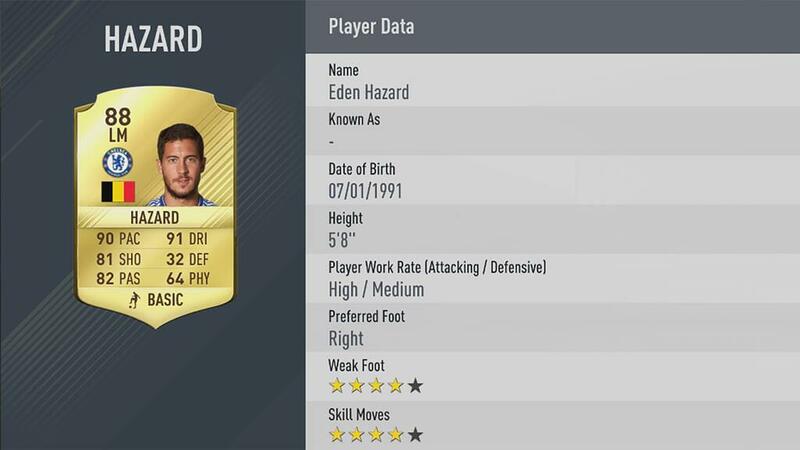 It's time to go all hands on deck for FIFA 17 as player ratings are finally coming out with a month to go. As is tradition with EA Sports the ratings are being revealed over the course of the next week in groups of ten. We're here to discuss the next ten players on the list, numbers 30-21, and the excerpts included from EA's website. The FIFA 17 Ambassador is a wonderfully gifted and dazzling footballer. The Chelsea left midfielder possesses 90 Pace and 91 Dribbling making him incredibly dangerous to opposition back-lines. Chiellini is a tough tackling center back with 90 Defending and 85 Physicality, making him an immovable object at the back. Cech has continued to impress since moving to Arsenal. His 90 Handling makes him one of the best at his position in all of FIFA 17. The Real Madrid man is one of the best passers of the ball in world football. The center midfielder has 88 Passing, one of the highest in all of FIFA 17. The legendary Italian goalkeeper continues to excel for Juventus. Buffon is excellent across the board but his 90 Positioning is especially impressive. Your FIFA 17 Cover Star Marco Reus is an elegant left midfielder. His 90 Pace is frightening, not to mention his 86 Dribbling and 85 Shooting. 90 Dribbling and 87 Passing summerise Andres Iniesta well. A dazzling center midfielder who is one of the best in the world at what he does. Godín continues to be the heart and soul of Atletico Madrid. His 88 Defending make him one of the best center backs in world football. The FC Bayern right back is one of the most consistent performers for both club and country. His 84 Dribbling and 86 Defending make him an invaluable addition to your defense. If you are looking for a devastating passer of the ball at center attacking midfield then look no further than Kevin De Bruyne. His86 Passing puts him among the elites in FIFA 17.